Note: This restaurant has now closed. 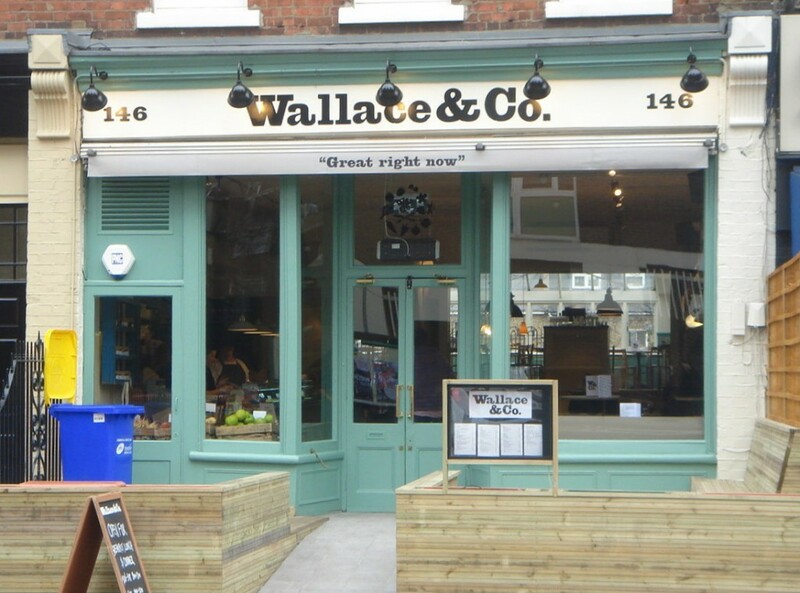 Wallace & Co is the new cafe/restaurant (opened about three weeks) undertaking by Greg Wallace of Masterchef fame. You know, the self-proclaimed “cooking woman’s crumpet”. The happy chappy with the shiny skull and the big booming voice, who along with John Torode, came up with some rather memorable (or depending on your viewpoint – laughable) turns of phrase on the show. Wallace & Co is located in Putney, rather than the more competitive locales of Central London, and it looks the part of a wholesome neighbourhood restaurant. It’s cosy, airy and spacious, and decorated in warm green and beige colours, it feels so homely that you can’t help but want to go in and sip a cappuccino or two. The centrepiece at the front of the restaurant is a huge wooden table, littered with scrumptious looking baked goods. There is also a take-away salad bar, and, something that should come as no surprise, vegetables for purchase (Greg is a wholesale greengrocer after all – his business is called Secrett’s Direct). Behind the front section is the split level dining area. The restaurant is open all day, everyday. The breakfast selection is available until noon and dinner is available from 6pm until close. There is also an all day menu (made of up salads, soups, pies, and desserts) which makes for an appetitising read. The restaurant is child friendly too – this message is clearly communicated with a smattering of kid’s choices. We went for dinner and started with a selection of three salads. Priced at £6, this offered both variety and value for money as individual salads range in price from £3.50 to £5. We went for the Imam bayaldi (a spiced Turkish aubergine dish) which was resplendent with the flavours of soft aubergine, tomato, cumin, coriander and olive oil. A salad of pickled beets (red and yellow) was nicely crunchy and not overly vinegared. It was topped with some wonderfully pert and fresh baby watercress and goat’s curd. Only a celeriac remoulade with some tasty bresaola slighty let this display down with, a remoulade that was a touch too mustardy. After such a generous portion of salads, there really was very little room for another starter of smoked mackerel pate with toast (£4.50). 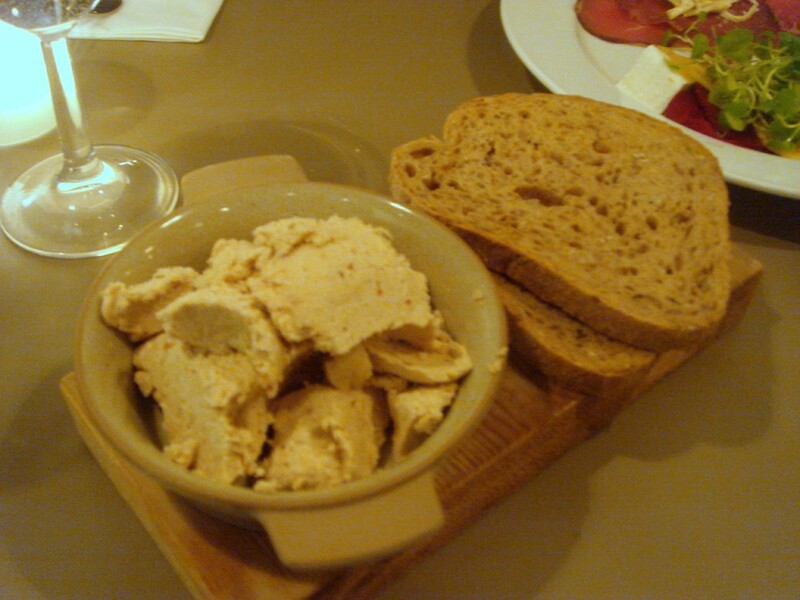 But the pate was well worth ordering as it was divine. Creamy, it was rich with the flavour of the smoky oily fish. 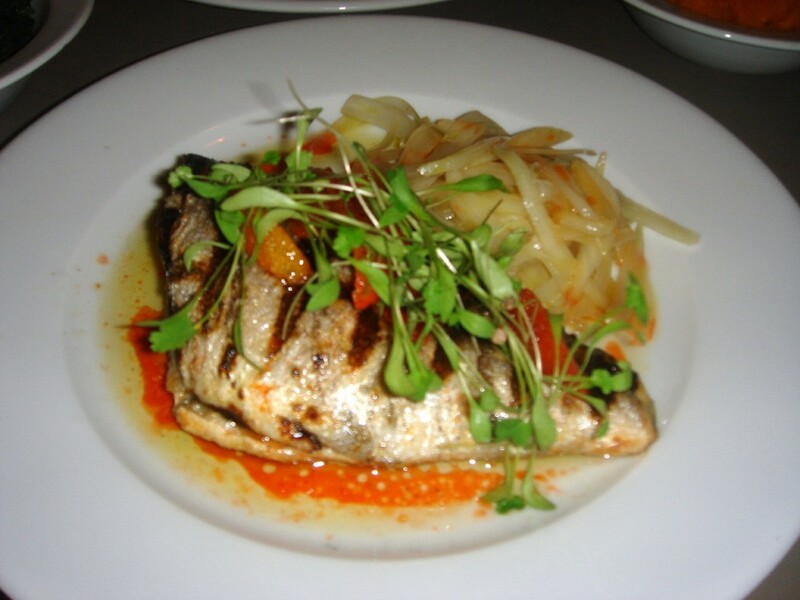 Mains were a rib-eye steak with chips (£15) and a grilled sea bream on the bone with fennel and orange (£13). The steak, while cooked pink, was disappointing as it really ‘didn’t get tougher than this’. The chips were lovely though. Triple-cooked, they were soft in the centre and crispy on the outside. I asked for the sea bream to be slightly undercooked and it turned out perfectly moist. The caramelised slivers of orange were a nice juicy addition, and the fennel, finished with olive oil, worked well with the fish. At the encouragement of the waitress, we also ordered some sides including a swede and carrot mash (£2.50) which was lovely and creamy, and some spinach (£2.50) which was slightly overcooked and bland. In retrospect, we had ordered too much food. With the salads and the smoked mackerel to share between two, I was almost full by the time we got to the mains. Therefore, avoid getting sides. Did I say there was too much food? 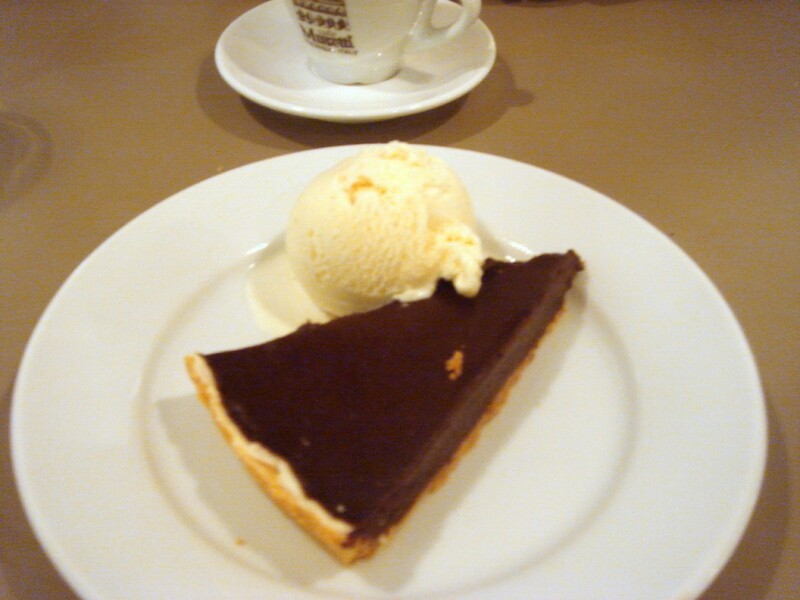 Well, we managed to squeeze in a dessert, which was a lovely dark chocolate tart with vanilla ice cream (£5.50), a concoction presumably inspired by the sweet tooth of Mr Wallace. Service was really, really nice and very sweet. Although one of the waiters wasn’t particularly clued up – it could have been his first day – he was so lovely that I would have forgiven him even if he had accidentally dropped food all over me. Head chef is Tim Payne, who was once the executive chef at Marco Pierre White’s restaurants. On the night of my visit, Tim could be seen walking up and down the restaurant. On inquiring with one of the waitresses, she also mentioned that Greg is also there quite often and that he’s really hands on, something which was nice to hear. 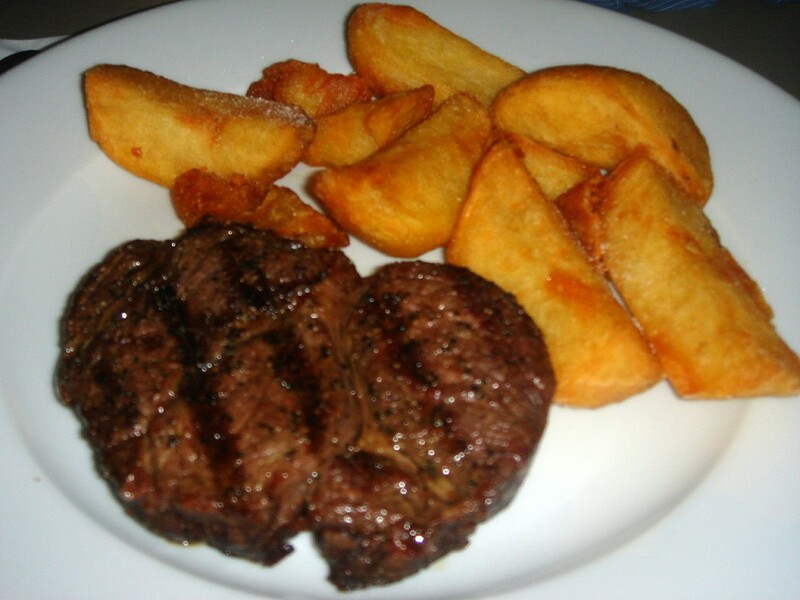 Overall, the food was excellent, so it was disappointing to be served such a tough piece of steak. But this wouldn’t put me off going to Wallace & Co. again. 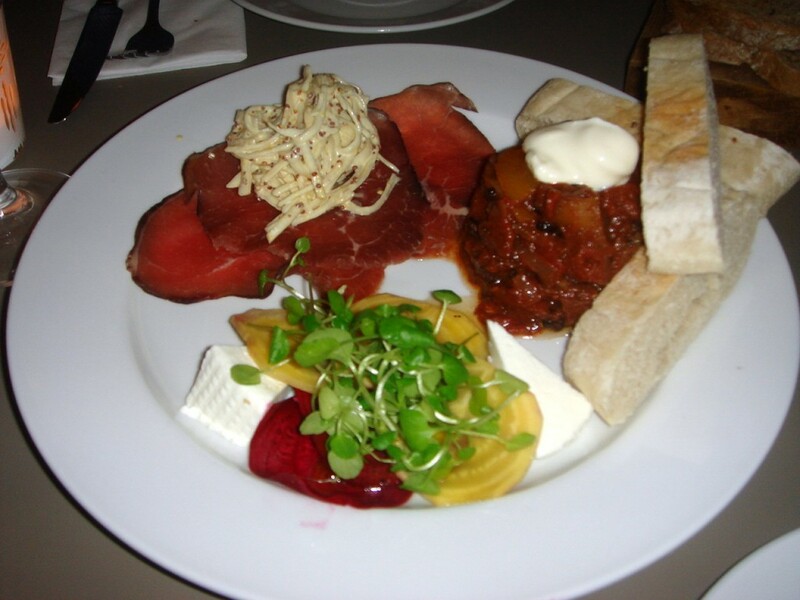 The food oozes freshness and is handled with care and thought. It’s simple, uncomplicated food, and the portions are decent and the pricing is fair. There is a rumour that Wallace & Co might be rolled out as a High Street chain, which I think would be a shame, as it would probably loose some of its wholesomeness and personal touch. So go, before it gets too big. BTW, Happy Valentine’s for this Sunday! I can’t think of anything better to eat on this day than chocolates. Here’s some lovely heart shaped ones from Hotel Chocolat that you might want to consider trying. Price range: 3 courses from £16 to £27. Excludes drinks and service. Interesting. I assumed this place may be just cashing in on Greg Wallace’s celeb name but it sounds like it is actually quite decent. i went and thought it very very poor; amateurish service, very average food, some surprise supplements on the bill. your positive review is in the distinct minority if one reads other sites (london-eating) and indeed newspaper critiques (guardian in partic got the knife out). The place comes across as a rather cynical attempt to leverage c-list celeb name recognition. you are naiive in the extreme if you think that the ever irksome gregg will remain ‘hands on’. wallace&co is several measures worse than places like valentinas and moomba; proper local businesses that deserve our suppport. I am sorry you had such a disappointing experience. What I would say though is that I would never assume that restaurants remain stagnant. I am a firm believer that a restaurant that is good now can become poor in a years time. This can be due to factors such as a change in chef, suppliers, etc. I tried to allude to the non-stagnant nature of the business by mentioning how Wallace & Co might be rolled out onto the high street and what a shame it would be. why would you want to roll out something crap? Perhaps the restaurant’s standard has dropped since it first opened. I can’t comment exactly as I haven’t been back since then. But what I can comment on it that this is the second time you have commented on my Wallace & Co blog post. On both occasions you have slated the restaurant and been rather negative towards me. I can understand you leaving a first comment – but a second comment on the same restaurant? Also, unlike other readers of my blog who may leave messages on various posts from time to time, this is the only one of my write-ups you have commented on. These two reasons and your tone now makes me believe that you have a gripe with Wallace & Co. Are you in direct competition with them? Are they taking business away from you? I have no issue with readers leaving comments on my blog provided they are constructive and objective. i hadn’t realised that you had replied to my first post way back when until yday. i have no axe to grind other than offering an opinion different to that contained in your puff piece. whether this is constructive is a matter of opinion though it seems a bit rich for a food ‘critic’ to be so sensitive about criticism! I am not being sensitive to criticism. If I was, I wouldn’t publish your comments at all. Its just curious that you keep insisting on having a go about Wallace & Co.
“keeping insisting on having a go” um that’s 2 posts in 10 months…hardly internet stalking is it?